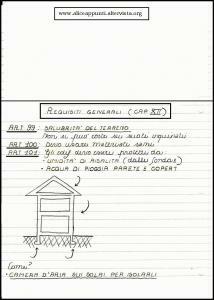 IL CORSO DI ARCHITETTURA TECNICA PREVEDE, OLTRE ALLA PROGETTAZIONE DI DIFFERENTI TIPOLOGIE EDILIZIE E PARTICOLARI COSTRUTTIVI, ANCHE L'ANALISI DI ALCUNE NORMATIVE TECNICHE RELATIVE ALLA PROGETTAZIONE EDILIZIA. TRA QUESTE VI E' IL REGOLAMENTO EDILIZIO, SCARICABILE GRATUITAMENTE DA INTERNET. SOLITAMENTE NON TUTTA QUANTA QUEST'ULTIMA NORMA E' OGGETTO DI STUDIO, MA SOLTANTO QUEI CAPITOLI CHE RISULTANO MAGGIORMENTE UTILI ED INERENTI LA PROGETTAZIONE EDILIZIA. 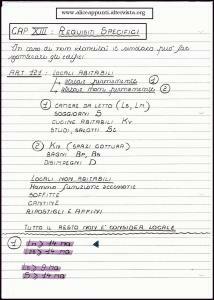 GLI APPUNTI DI QUESTA PAGINA SONO UN'ANALISI DI ALCUNI DEI PARAGRAFI DI QUESTI DUE CAPITOLI. E' CONSIGLIABILE UTILIZZARE QUESTI APPUNTI IN CONTEMPORANEA ALLA LETTURA DEI SUDDETTI PARAGRAFI DELLA NORMATIVA, IN QUANTO RISULTANO UTILI PER CHIARIRE MEGLIO I CONCETTI BASE E FISSARE LE IDEE, E NE COSTITUISCONO UN BREVE RIASSUNTO. INOLTRE DANNO UNA BUONA IDEA DI QUALI PUNTI (NEI PARAGRAFI PIU' LUNGHI) E' NECESSARIO SAPERE MEGLIO, E QUALI QUESTIONI POSSONO INVECE ESSERE TRALASCIATE. I PARAGRAFI 117-119 (RELATIVI A CORTILI, CHIOSTRINE E CAVEDI) NON SONO INVECE STATI APPROFONDITI, SEBBENE IMPORTANTI: E' SUFFICIENTE LEGGERE QUANTO RIPORTATO NELLA NORMATIVA. I PARAGRAFI 124-128 (RELATIVI ALL'ILLUMINAZIONE DEI LOCALI, AI REQUISITI DI AERAZIONE, ALL'ALTEZZA ALLOGGI E LOCALI, E AI SOPPALCHI) NON SONO STATI INVECE APPROFONDITI, SEBBENE IMPORTANTI: E' SUFFICIENTE LEGGERE QUANTO RIPORTATO NELLA NORMATIVA. DEI DUE CAPITOLI APPENA VISTI, SONO STATE REALIZZATE ANCHE ALCUNE PAGINE CHE NE RIASSUMONO I CONCETTI PRINCIPALI PER LA PROGETTAZIONE. 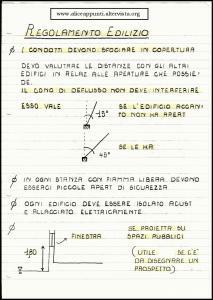 ESSE RIPORTANO CIOE' SOLO QUELLE NOZIONI -TRA TUTTE- UTILI PER ESEGUIRE LE ESERCITAZIONI DEL CORSO DI ARCHITETTURA TECNICA.